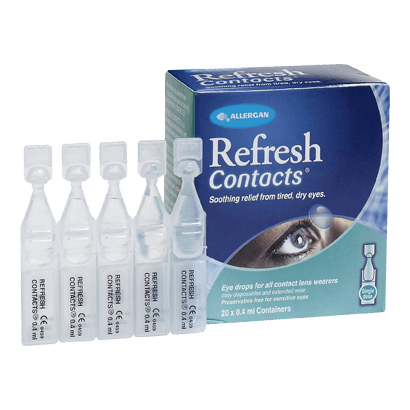 Review Refresh Contacts Vials Perfect for all contact lens wearers. I find these the best on the market. Review Refresh Contacts Vials excellent refresh when eyes feel tired. Review Refresh Contacts Vials These vials are great for refreshing dry or tired eyes! Very happy with them. Sometimes all contact lens wearers feel their eyes becoming tired or dry. No matter how perfectly your lenses fit, and how great their vision is, sometimes you will need a refresher. Refresh Contacts Vials provide an ideal way to boost lens comfort and ensure that you make it through the day without discomfort. Suitable for all lenses, the Refresh Contacts Vial is a vital standby for any lens wearer, and could be a lifesaver in tricky situations. • Provides an effective, easy to use solution to the grittiness and redness associated with dry eyes caused by contact lens wearing. • Stored in handy vials, Refresh Contacts Vials can be carried around in pairs so that you have exactly what you need, whenever you need it. • Comes in boxes of 20 vials, each one containing 0.4mls of solution. • Appropriate for any kinds of contact lenses, at any time of day - the ultimate in contact lens care convenience. • Just apply the specially controlled dosage contained in each vial and within seconds the symptoms of dry or painful eyes will disappear. Give yourself an optical pick me up with a stash of Refresh Contacts Vials. These little wonders will be a convenient, effective tool to have on you when dry eyes cause discomfort. Don't be stuck in the office or aeroplane cabin without them.